1. During the payment process, on the receipt option, if customer taps on Email receipt, they would begin typing the beginning of their email address. 2. 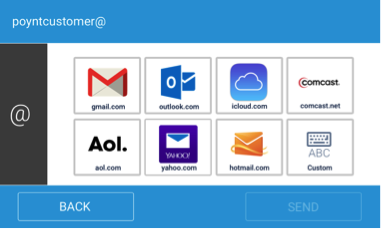 When they tap the @symbol, a new screen is presented with icons indicating the major email address domains: gmail, outlook, icloud, comcast, aol, yahoo, hotmail, and custom domain. 3. 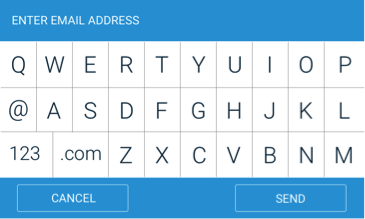 Tapping on the email domain icon will auto-complete the remainder of the email address. Tap Send to complete the email receipt process. How do I assign a Receipt Type to my Printer?